Celebrating Jazzy Vegetarian Television Show’s Fourth Season with a Recipe & Giveaway! Laura’s beautiful Pear & Apple Breakfast Pizza (below) epitomizes what I appreciate about her recipes: wholesome ingredients, a cinch to put together, and absolutely delicious results. You must try this recipe. It’s so very, very good! I’m also very pleased to be able to give away one SIGNED copy of Jazzy Vegetarian Classics to one of my U.S. readers. Preheat the oven to 375-degrees. 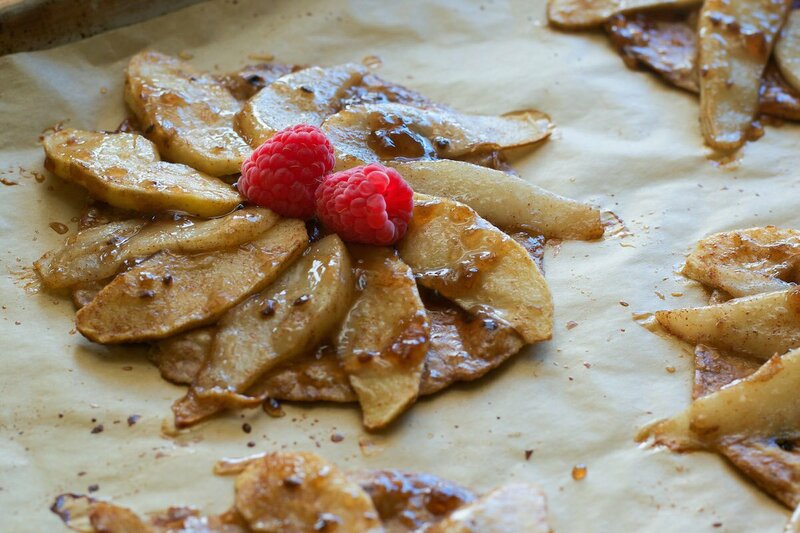 Line a medium, rimmed baking sheet or pizza pan with unbleached parchment paper. Put the tortilla on a large dinner plate. Put half of the maple syrup in a small prep bowl. Coat both sides of the tortilla with a thin, even layer of the maple syrup, using a pastry brush. Put the apple slices, pear slices, remaining half of the maple syrup and cinnamon in a medium mixing bowl and stir until evenly coated. Arrange the apples and pears on the top of the tortilla, slightly overlapping the slices in a spiral pattern to cover the entire tortilla. Transfer the tortilla to the lined baking sheet. Bake for 30 minutes, or until the fruit is soft and the edges of the tortilla are crisp and golden. Put the baking sheet on a wire rack. Meanwhile, put the raspberry preserves and water in a small mixing bowl and whisk together to combine. Add a bit more water if the preserves seem too thick to spread over the pizza. Spread the preserve mixture evenly over top of the pizza while it is still hot, using a pastry brush or small spoon. Let the pizza cool 15 to 20 minutes. Transfer the pizza to a cutting board and cut it into four slices using a serrated bread knife or pizza cutter. Serve warm. You may use your favorite variety of preserves (such as; apricot, strawberry or blueberry) in this recipe in place of the raspberry preserves if you prefer. I shared Laura’s recipe at Virtual Vegan Linky Potluck 15. And now for some photos of other Jazzy Vegetarian recipes! My favorite vegan is definitively Malaï Kofta in vegan side ! Everything looks delicious…especially those muffins! I’m a muffin girl. Oh, and I know, right….what’s up with everything being about reality shows nowadays? I actually don’t really ever watch tv, but I do have my recorder always set to record Giada, that’s about it. I have loved her for years and she actually cooks! I’m glad they still have a lot of cooking shows, but definitely TOO many reality shows! Giada is great! Thank goodness they’ve kept some of the real cooking shows. In truth, I don’t have cable or satellite TV at home :-P, but when I travel I often try and catch some good cooking shows. Ooooh, a vegan classic, you say? I love the simplicity of a cliche portobello burger! Like I always say, it’s not a vegan menu if it doesn’t have a portobello burger mentioned SOMEWHERE on it! Nothing wrong with a good portobello burger! About as classic as one can get! IT’S SO GOOD!! You have to, have to make it. So many choices! I think I have to go with the good old tofu & veggie stir-fry. Thanks for the giveaway Annie! I’m a big Jazzy Vegetarian fan and would love to have this book. A classic, Terri! Thanks for entering – – it’s a wonderful cookbook. My favorite vegan classic is cheese-less veggie pizza with whole wheat crust…such a yummy comfort food! Vegan classic has to be raw truffles – of any flavor I think. I haven’t made any yet that lasted more than 2 days! I need one of those muffins though…NOW! Yes. Yes, you DO need one of these muffins! My favorite is the most versatile classic: a grain, a green, and a bean- usually freekeh, spinach and peppers and onion, and black beans. OH MY that breakfast pizza..YES. I gave up on cable a few years ago and have discovered that we have three PBS channels over the air and one has cooking, travel, gardening, and home shows all day==for free! HGTV and FoodNetwork had become sad reality show havens! You are spot on, Arthur! I used to love HGTV as well – not it’s unwatchable. Favorite vegan classic is a mexican bean bowl! That breakfast pizza looks stunning & appetizing too! I knew that woman. I made a few of her tasty recipes & they all worked out fine! Those muffins look great too! I haven’t tried any of her recipes yet, but the breakfast pizza looks good and I am going to make that. It’s really tasty, Purnima! You’re going to love it! I make a great shepherd-less pie using homemade tempeh. My favorite vegan dish is eggplant parm with diyia cheese! For a classic, I have to go with vegan mac and cheese. Oh for sure! The best classic out there! Noodle dish with peanut sauce and green beans!